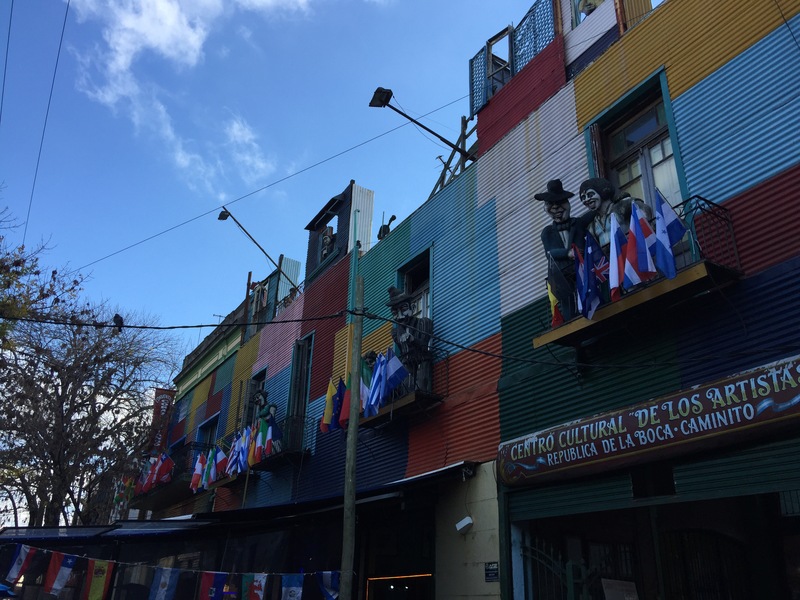 We arrived in Buenos Aires at midday and after a relatively expensive taxi past the sights (which our driver explained in Spanish) and traffic, we got to our hotel. We had several days in the city so there was no rush like usual. It was clear from our taxi ride that there was a lot of stunning architecture to explore and see. Late afternoon we headed out and explored the area immediately around our hotel. 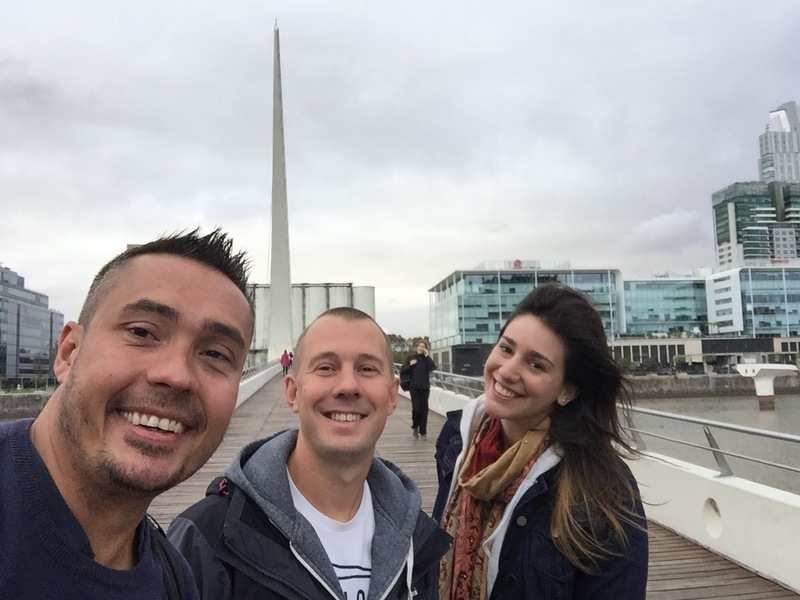 We were located in central Buenos Aires near the obelisk, theatres and shops. The obelisk stood in the middle of a junction illuminated at dusk. 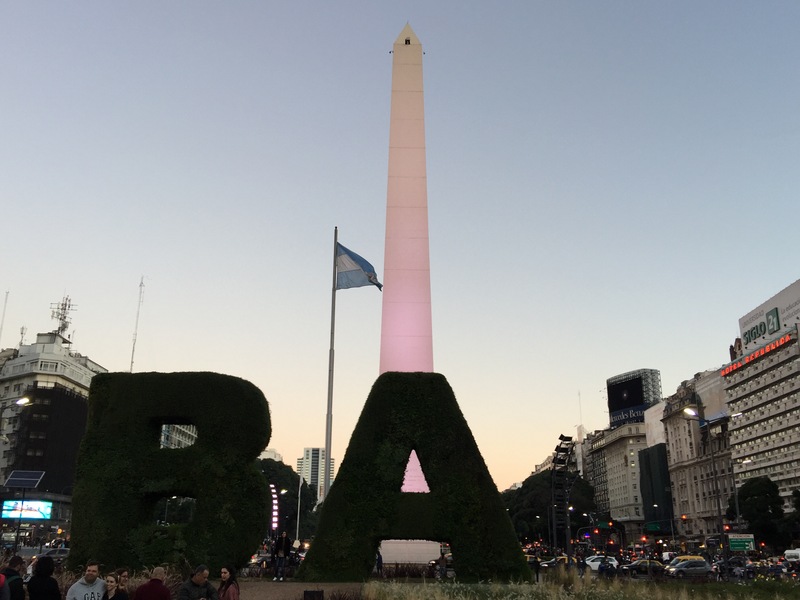 Next to it as well was a giant ‘BA’ for Buenos Aires which made for a good photo if it weren’t for lots of tourists doing selfies! Wondering around we looked for somewhere for dinner, which was harder than we’d thought as it turns out Argentinians eat late, very late- so no where was open. Eventually after some time ticked by we found a nice little restaurant. After some wine and much needed food we got sleep ready for a long day of sight seeing. First up we headed to the main plaza or square where Evita made her famous speech. All around where impressive buildings and architecture. Similar to that of London, Paris or Barcelona. One striking difference though it was never bombed during the war so there was so much of it on every street corner. Here we also visited the Pink Palace and were in the right place at the right time to capture some Argentinian traditional guard marching across the street. The Pink Palace is where the president use to reside. From here we walked to the other side of town, passed the Embassies and other impressive buildings reaching a university and a giant flower sculpture. Several metres height and we learnt afterwards that it opens and closes and different times of the day. 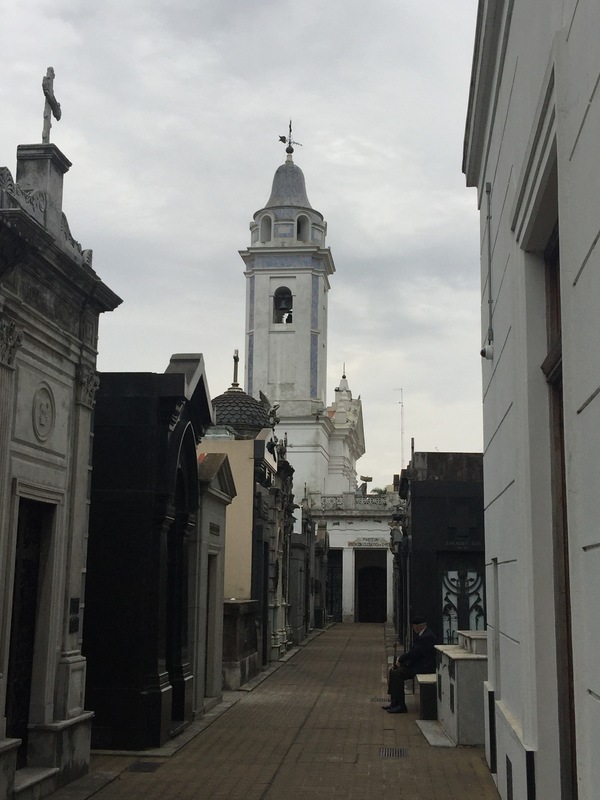 Next we stopped at the Recoleta Cemetery: a top sight on google to visit. Here we viewed the many mausoleum of past famous and influential Argentines; including Evita which by far the most visited site. Having both never really visited mausoleums before it was slightly morbid and fascinating at the same time seeing the elaborate tombs and the ones which were falling down. Next we walked back into town and to the National Congress building. A huge stunning building with columns and a dome but it was now raining so we didn’t hang around long. A local told us to go across the street and take a picture from the national library building upstairs which was free. We entered the library and after a lot of confusing Spanish were issued with library cards and allowed to enter. However there were no stairs up or lifts or even windows so it was a pointless exercise. But we can now withdraw books from the Argentinian national library! The following day we headed to the area know as ‘Boca’. Next to the original city port were the locals used old sheet metal from the docks to construct their houses; and paint them in bright colours according to what they could find. Hence they never had enough of one colour to paint the whole house, so used lots. Today it is more touristy selling wears, with restaurants and shops but is in the shadow of Boca Juniors Football stadium. We strolled the streets taking pictures of the buildings and their bright colours as well as the tango dancers and creepy looking puppets that all stood in the windows. Next we found a street restaurant and had some huge 1 litre local beers, of which we had way too many! We had to get a cab back to the hotel and took an afternoon nap before meeting a friend in the evening, who we had met travelling in India. Marianela picked us up from our hotel and took us to a local restaurant or ‘canteen’ as she called it. We had some local steak and red wine and enjoyed some good conversation and catch up about travels. The restaurant had hung different national football team shirts from the ceiling and had famous faces (Argentinian) across the walls. We also went out for some drinks and cocktails afterwards at some local bars. The following day (after a lie in with hangovers) we again met up with Marianela. This time we took the metro to the dock area where we walked and ate lunch. Rain prevented us flying the drone but we explored anyway. We walked back via the Pink House and discovered an enormous Argentine flag flapping in the breeze. Studying architecture she also took us past some of the buildings we had missed. In the evening we all went to a party of some of Marianela’s university friends. Most spoke little English and there were a few funny moments in translation. The stand out was the BBQ they did. Two huge pieces of meat were slapped on the grill and cooked to perfection. We ate as we were told first in roles with all sorts of sauces and then in small chunks with fingers- all delicious. Apparently they get together and so this every week!